Raw Paw Pet Food is an online website that provides health supplements, foods, and treats for dogs and cats of all ages. Raw for Paws Complete Ground Beef for Dogs and Cats is suitable for both dogs and cats, your pet will love the beefy taste. It contains 80% meat, 10% bone, and 10% organ that have been USDA inspected and AAFCo approved. For those who are looking for raws for paws, then this is the best company to deal with. Raw Paw Pet Food offers you excellent “raws for paws” that are freeze-dried, grain-free, antibiotic-free and absolutely made in the USA. Raw Paw Pet Food is an online website that provides health supplements, foods, and treats for dogs and cats of all ages. The company has its headquarters in Indianapolis, IN and has good experience in maintaining excellent rapport with pet owners. For those who are looking for the best way to feed raw or partial raw foods to your pet, this is the best site for you. The company offers you top quality freeze-dried complete meals, grain-free kibble, patties, and more. It doesn’t matter if you an expert pet owner or a newbie when it comes to raw feeding, the customer care support is there to help you out with any queries. The customer support also delivers you a 100% Free Custom Meal Plan keeping in tone with your pet’s health. There are many top products of Raw Paw Pet Food. However, I am quoting only a few so that you get an idea of what exactly the company offers. You will also find a separate section for dog food, cat food, organ-wise, and meaty bones. Suitable for both dogs and cats, your pet will love the beefy taste. This all-natural, ground beef is derived from cows that are raised on family farms. They are humanely harvested using the Temple Grandin methods. It contains 80% meat, 10% bone, and 10% organ that have been USDA inspected and AAFCo approved. This gives your pet a balanced meal fulfilling all the requirements of the body. It is available in a 5-pound tube and 25-pound case that contains five, 5 lbs tubes. This product is one of the best sellers from Raw Paw Pet Food. It is one of the best raws for paws that comes with hormone-free, antibiotic-free modifications. This naturally complete chicken comes with the perfect ratio of 80% meat, 10% organ and 10% bone that ensures that your dog/cat gets a perfectly balanced meal. A grain-free product, Raws for Paws Complete Ground Chicken for Dogs & Cats is AAFCO approved and is sourced from the USA raised chickens. They are available in the purest raw format making it free from fillers, additives or preservatives. It is available in a 5-pound tube and a 25-pound case (that consists of five, 5 lbs tubes. Loaded with many nutrients such as B-vitamins, vitamin K, niacin, potassium, and selenium. An Ingredient such as potassium prevents hypokalemia (low potassium levels) thus preventing loss of appetite, poor growth, feeling weak and tired. A new addition to the Raw Paws Pet Food, these freeze-dried tripe mini-nuggets are taken from stomach muscles of free range cows that have been raised on the USA family farms. They are humanely harvested using the Temple Grandin Methods. Serve these freeze-dried delicacies as a meal, snack or a treat. You can always mix it up with partial raw diet for enhanced texture and flavor. This is a great nutrition booster. It is available in a 4-ounce and 1-pound resealable bag for easy handling and storage. Cell carcinoma is one of the major problem seen in most of the pets that makes them frustrated and powerless. For such dogs, Life Gold Dog Cancer Support is a miraculous medicine that’s highly recommended. Popular treats – Rawhide, animal ears, bully sticks, soft treats etc. Special diet treats – Single ingredients, Non-GMO, Gluten Free, Hormone Free etc. One of the best-selling products of Raw Paw Pet Food, this is a must-have for every pet owner. There isn’t one dog who doesn’t love to chew on a bone. A long-lasting compressed bone, it is all-natural that gives your dog the utmost satisfaction of their urge to chew. They are made from beef hide layers that are tightly pressed under extreme pressure. It is an extremely dense and safe chew for your dog. Absolutely nutritious, it is rich in protein but equally low in fat. It provides your pet some of the best hours of fun and joy. It is available in 5, 10 and 20 count sealed bag. Even though one of the best-sellers, pet owners have not taken a small amount of time to quote a review. If you love this product, come back and take a small amount of time to write what you feel about this bone. Your reviews do make a difference. Your dog/cat will love this jerky that is rich in flavor. It is made out of high protein, 100% low-fat chicken breast fillets. Void of any preservatives, additives, and artificial coloring, it arrives in 4 oz, 8 oz and 16 oz resealable bag. 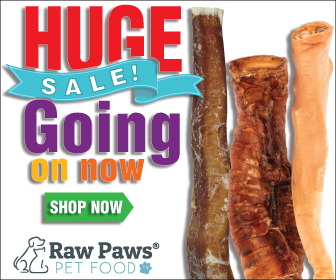 A healthy digestible product, the Jumbo 6” Bully Sticks is one of the raws for paws best sellers. A true USA product, it is not only long lasting but also made out of a single ingredient. A safe and healthy product, it is taken from USDA inspected beef. It is free of antibiotics, additives, and preservatives that rob the nutrition from the product. It comes in a dehydrated form. The texture is dense and quite hard. These raws for paws sticks are available in a 2-count and 5-count resealable bag. Protein-based chews – Elk, Lamb, Beef, Ox etc. Specialized Diet based chews – Single ingredient, grain free, Antibiotic free, Hormone free, wild caught etc. These all-natural cow ears are manufactured in the USA. They are derived from harvested cows and is relished by all dogs, irrespective of breed or size. They are not only long-lasting but equally rich in flavor. In fact, they can provide long hours of enjoyment not to mention efficient mental stimulation. This is an excellent product for dogs who are suffering separation anxiety or much high energy levels. This can put them in a good mood not to mention keep them occupied for a long time. This raw paw dog food is available in a three, 4-count resealable bags. Lillian Bromley from Half Moon Bay, CA – “My chocolate lab loves the chews. It is evident they are making it out of a top quality product. The company delivers it as promised and what’s better – they are made in the USA. A grain-free and gluten-free product, these raws for paws lamb esophagus twist treats for dogs & cats are loved by pets of all ages, breed, and sizes. It comes in elongated 12 inches featuring two esophagus that have been twisted together. It is sold in a package of six making your pets literally pounce on you for more!!! Julie Buxton from Whitehall, MI – My young Aussie Skye loves all the treats we had got from Raw Paws pet food. Whenever we feel we are running out of stock, we order gain. All the foods are healthy which makes us stick to the brand. Dawn Sanders from Murray, KY – My kiddos have got teeth issues. So I thought this can get them to chew on for a while. It helps in scrubbing the teeth and getting rid of any tartar without damaging the teeth. This Holiday Season gift your pet with the small chew pack. Trust me, your pet will love the variety of chews – beef esophagus strips, compressed rawhide, lamb ears, and dental chews that are available in the chew pack. This ready-to-buy gift pack is available at an economical price. Currently, there are no reviews found. If you buy this product, make sure to take a few seconds and write down your thoughts. Your reviews can actually help other pet lovers. 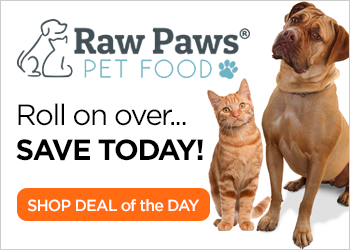 Rawpawpet Food is offering FREE SHIPPING anywhere in the USA on its raws for paws products. The company offers free shipping on Non-Frozen items above $49+ and above $199+ on Frozen items. If you are placing the order before 2 pm EST, your order will be shipped the same day. The company does NOT come with a return policy for hygienic reasons. However, if you have received a damaged or defective product, you are eligible for a refund. Raw paw Pet Food also provides you with store credit, if you are planning a purchase in a future date. Signing up to newsletters is one of the best ways to stay updated on latest promo deals and offers. The company itself offers great discount codes on their raws for paws. The above offers are available until 31st December 2016. Where is the head office of Raw Paw Pet Food? The office of Raw Paw Pet Food is located at 5601 Fortune Circle South, Suite P, Indianapolis, IN 46241. How will I contact the company for my “raws for paws”? You can contact the customer care at (866) 368-3369 or mail them at customerservice@rawpawspet.com. Are the products available at amazon? Yes, the pet foods of Raw Paw Pet Food are available at amazon. Will there be any side effects after using these pet foods? Since the pet foods are all natural, there are no chances of adverse reactions. Can I return if the product does not meet my expectations? If you feel a pet food was an unnecessary purchase, damaged or just unhappy with the product, you need to complete a form (https://www.rawpawspetfood.com/returns.asp) describing in detail why you are unhappy along with a picture of the product etc. The customer support will have a word with you thus finding an amicable solution. 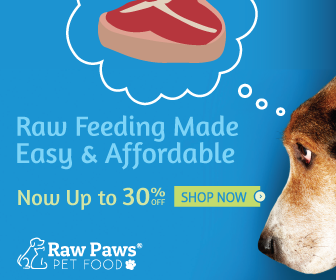 To sum it up, Raw Paw Pet food is a great website that offers great raws for paws foods – be it frozen or non-frozen. The customer service has received excellent reviews from pet owners for being a great support. The price is affordable without burning a hole in your pocket. You can also avail of auto-shipments that will give you great savings and features such as 10% on the first autoship, email reminder, free shipping on orders and more. For those who are looking for pet-friendly products with natural ingredients, then Raw Paw Pet Food is the best site for you and your babies.